How am I experiencing or seeing God's presence? 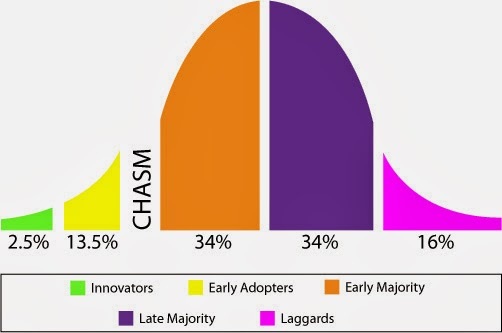 Bishop Maas made a strong case for why church leaders aren't called to be innovators or even early adopters, rather leaders are called into the chasm. He certainly piqued my interest in the topic. One of the questions I will continue to wrestle with is who are these leaders? Are they pastors? Lay staff? Volunteers? Church councils? Consultants? Elders? Youth? Furthermore, do our congregations want pastors who will bridge the gap between the 15% and the 85%? Patrick Scriven, blogging for the Pacific Northwest Methodist Conference, doesn't think the church needs more innovative pastors. I'm curious to know what you think. In the meantime, I'm excited to have the rest of the weekend to keep learning from the young people at this leadership retreat.